i can feel it happening. it's coming together, people are interested in my art, and the shift is upon me! mark and i worked on designing my business cards and i think it's time we just get them made. this is the medium one! this morning i woke to a commission! this will be the first one i have accepted, and i'm a bundle of nerves. the client is someone i know and love dearly, and she asked my opinion about what subject would be best for the situation she spoke about. i already had an idea in mind and asked her if she thought it would fit and she agreed it would. i'm excited to get to work on this painting, which won't be posted until later. she wanted the original, which is such an honor. this weekend i need to buy a canvas in the correct size. i also need a good, small paintbrush. yay for shopping! a few hours after getting the good news about my commission, mark called me on his way to work. he told me that while he stopped to get his lunch at our grocery store in town he spoke to the cashier and she told him that she heard a hobby lobby will be coming soon to the plaza! thats good news and very dangerous news, hehehe. mark told her that his wife is a painter and she sounded interested so he gave her my information! yep. time for business cards! 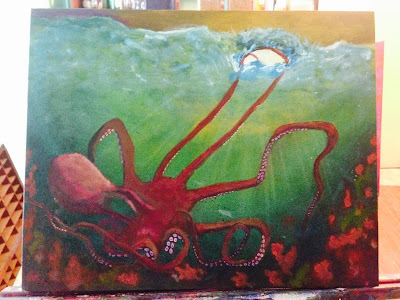 since i don't yet have a canvas to start my new painting i guess that means i must start working on my octopus eye. i've been adding to the coral reef, but have been procrastinating on the eye. adore the colors and texture in the coral! time to grit my teeth and get to work!